Short on time, but want to prepare a quick and healthy meal? Here are a few quick meal ideas using only simple nutritious ingredients. These options can be prepared quickly but would still be healthier than many alternative quick meals, especially since these choices are all natural. Sloppy Joes are an all-time American favorite. But they aren’t generally healthy. However, that’s no longer an issue if you choose to prepare Vegetarian Sloppy Joes. Heat in just a few minutes, add your favorite organic buns, and you’re ready to eat! Did you know that quinoa can be even more versatile than rice? It’s also quite healthy as well. If you can’t make it from scratch, there are many simple quinoa meal packages with a variety of flavors, such as basil pesto, artichoke & roasted pepper, garden vegetable, mango jalapeno, and many more. 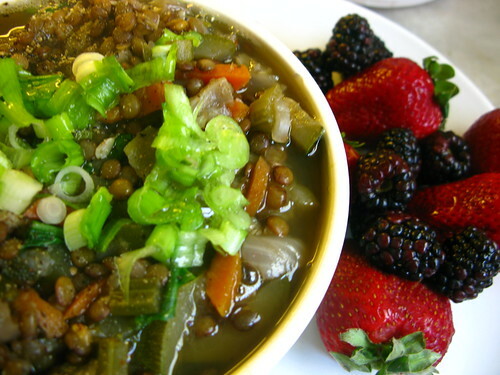 Lentil soup can be quite flavorful and wholesome, as well as quick. There are many canned and dried lentil soup options that can be made in mere minutes. Some flavors include onion, curry, garden vegetable, sicilian, low sodium, quinoa and kale, and more. Many of these only require simple stovetop or microwave preparation.